Reacting to lightning once we are caught out in it is an uncertain art. No one can tell us a certain way to avoid the lightning. All anyone can tell us are a list of things that should be good to do based on theory and study of actual incidents that went badly. If we’ve made the mistake of getting caught out in lightning, we’ve made a terrible mistake. Once we see or decide that the weather environment is unsafe, our goal for the day must change immediately and permanently to getting to a “safe” shelter. In the high peaks, usually this means getting to your car or truck (i.e., vehicle with metal roof and sides). Our path back to the car will take us through multiple locations, each falling into one of the four safety levels: high safety, low safety, not safe, and very dangerous. Note: Strategy #1 & strategy #3 are mutually exclusive, so we’ll need to understand when to go fast and when to get small. Strategy 2 is an all the time strategy that facilitates keeping us safer while we go fast but also enables us to safely get small in a moments notice. The juggling act will be the key to our continuing health. Let’s review each and understand when each is important. Of course, there are complications to implementing this simple idea atop the high peaks. The shortest hiking route between any two points in the mountains is never a straight line. And there are other, more likely hazards atop the high peaks that do not go away simply because the weather has turned for the worse. Gravity kills and injures many more people than lightning. And reckless, panic driven running over a loose trail or wet rock can result in such a bad fall that lightning risks will be far from mind. And further, a short path through a few isolated tall trees combined with a jolt of electricity might take much, much longer than a longer path around the trees. We need to move as quickly as possible and take the most direct path to the car as possible, but we’ll need to bear in mind strategy #2 at all times. Direct strikes (approximately 3-5% of injuries) cause maximum injury because the entire charge of the lightning passes through or over the person’s body. Because of the short duration of contact during a lightning strike, often the charge passes along the surface of the body or clothing (when wet) in a process called “flashover.” When the charge merely passes over the body, less damage occurs, but severe burns are possible. We clearly need to avoid being struck directly by a bolt of lightning; we need to avoid being a tall, pointy, isolated object. Side flash, or “splash” (approximately 30% of injuries) occurs when the lightning jumps from the primary strike target to use a secondary target as a pathway. For example, when lightning has hit a tree, the electrical charge running down the tree may jump over to a nearby person (who may be a better conductor) and use the person as a pathway to the ground. 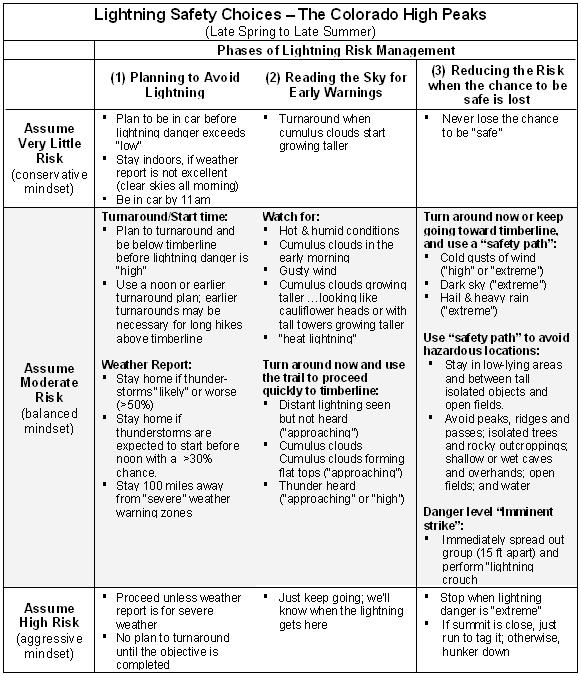 The risk of side flash varies by the object and the conditions, but we should always stay at least 10 feet away from any object that is subject to lightning strike to avoid a side flash. A ground strike (approximately 30% of injuries) occurs when the charge hits the ground in proximity to a person. The electrical current spreads out in all directions along the ground following numerous paths of least resistance, including cracks and crevices filled with water, wet rock, wet climbing ropes, and root systems. In the opening of caves and under overhangs, the current can jump across the gap. The charge dissipates as it moves further away from the original strike point. If the current reaches a person within 60 feet, a mild or severe shock can result. When a person contacts the ground surface with two different portions of his body near the lightning-struck point, he receives injuries due to the current flow on the ground surface caused by lightning. The injuries of this type are called step-voltage injuries. If the person is in contact with the ground in multiple places (e.g., legs apart, a hand on the ground), the current can enter the body through once place and exit through another; allowing the current to run through the body. When the current runs through the upper body (say up a hand and down a leg), the heart can get enough of a jolt to stop beating. The extent of injury depends on a number of variables, including the composition of the earth that makes up the ground at that location (sand being a fair insulator and wet, salty and spongy earth being more conductive). We need to avoid being in running or standing water, cave entrances, rock overhangs, and we need to avoid lying on the ground or putting a hand down on the ground or a nearby rock. And when possible, we should keep our feet close together. Contact voltage from touching an object that is a part of the pathway of lightning current (approximately 1-2% of injuries), such as a tree, car or tent pole. Even sitting in the car but touching the external metal would allow the electrical current to run through the body. We need to avoid touching pools of water, metal fences, trees, cars, and any other long conductors that may bring the current from a lightning strike to us. Upward lightning streamer that does not connect with the downward leader to complete a lightning channel (approximately 30% of injuries). High-current pulses are launched from the ground (often tall, pointy, isolated objects) near the lightning bolt as it initially approaches the ground. These “streamer currents” are much smaller than the full lightning strike but are still often large enough to cause injury or death to humans. Once again, we need to avoid being a tall, pointy, isolated object. Between tall isolated objects and open areas; aim for more than 10 feet from any object, but no more than ½ of the objects height. Should the lightning danger become “extreme” we’ll need to shift gears. Once the lightning danger has become imminent, we need to give up entirely on our “go fast” strategy and focus on our “be small” strategy. 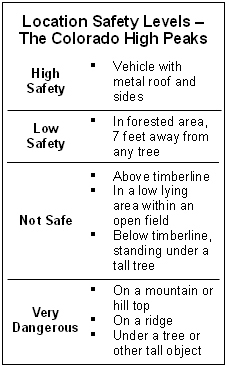 But when possible, we need to resume our efforts to get to low safety (timberline) and then high safety (the car). This strategy is based on the successful tradition of outdoors people assuming the “lightning crouch” when a lightning strike seems imminent. The lightning crouch is designed to accomplish two things: be a small target and reduce the impact of a near miss. And since we’ve been following a path that avoids dangerous locations, we can stop and perform the “lightning crouch” anywhere we happen to be when we notice the strong electrical field. Time is of the essence…don’t stop to remove gear or prepare something to stand on. Just immediately stop, spread out the group (at least 10 feet between each person), and squat. You may need to remain in this position for several minutes; it is an uncomfortable position, but if lightning is hitting around you, a little discomfort will seem light a small thing. When the imminent danger has passed or you just cannot remain in the “lightning crouch” any longer, resume your fast but careful path to timberline and the car. In my research, I found and used a number of credible sources of lightning expertise; there were others, but these seemed to cover the range of informed opinions. The experts don’t always agree; and I’ve attempted to be clear about the varied opinions when key differences exist. Using this information I have pieced together my own perspective using their recommended responses. These experts have not reviewed my use of their comments; you should do your own investigation in the development of your own lightning strategy.